“Occult Mysteries and Magic”, is topic of the May 2017 RPG Blog Carnival. Although my gaming group has been playing Dungeons & Dragons for decades, a game that has magic as one of its corner stones, we rarely delved into mysteries of the arcane. To be sure, there was ancient magic hidden in Greyhawk’s history, such as the Suel and Baklunish spells used in the Twin Cataclysms that destroyed two empires, but it wasn’t something we typically sought out (save for one memorable storyline involving several ancient Suel archmages awakened in the current day). For the most part though, we were focused on magic from the current era. Though rarer than in a setting like the Forgotten Realms, it was still a known quantity, with wizards guilds. True mysteries were far and few behind. 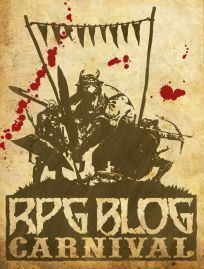 Enter the Weird Pulp campaign. When my gaming group launched our 1930s era Weird Pulp campaign for Savage Worlds, I found myself searching for a central mystery with which to drive the campaign. I had certain ideas that I knew I wanted to include — a lost civilization, strange artifacts scattered around the world, a forgotten island stocked with time-lost horrors, and a villainous organization dedicated to uncovering it all. I was drawn to the real-world legends of the lost continent of Mu. Proposed by Augustus Le Plongeon (who said it was in the Atlantic) and expanded upon by James Churchward (who put it in the Pacific). Like Atlantis, Mu was allegedly a home to an advanced civilization, but it was destroyed in an ancient cataclysm and sank beneath the waves. Even better, one of the characters — Alistair Sebastian Cadwalader Martindrake III — is obsessed with the legends of the lost continent of Atlantis. Mu feeds into that obsession (naturally he thinks Mu is Atlantis, or some variation there of) and helps drive things along. I created The Enlightenment, a secret society dedicated to uncovering the forgotten history of the Lost Continent of Mu. It’s leaders — who have titles like The Teacher, The Librarian, The Oracle, and the Warrior — seek to recover the lost powers of Mu … and possibly the continent itself. They are utterly ruthless in their quest for power, killing all who oppose them and opening ancient tombs without any regard for the curses that might lie within. Opposing them are the The Wardens Against the Twilight of Humanity. Their mission is best summed up by Hellboy’s Professor Trevor ‘Broom’ Bruttenholm “In the absence of light, darkness prevails. There are things that go bump in the night, Agent Myers. Make no mistake about that. And we are the ones who bump back.” This is the organization the player characters belong to and it provides them with the resources and connections to combat the Enlightenment. Over the course of first 17 episodes of the campaign the Wardens have uncovered a number of relics, some related to the Mu conspiracy, others random bits of arcana that exist in the world of Weird Pulp. Amulet of Tergal Dis Ra: Named for the King of Faltering Light — one of the guardians of Mu — this powerful relic allows the wielder to summon and command a spectral remnant of the lost continent. The Serpentine Bookmark: The coils of this silver snake bookmark appear to undulate with every sideways glance. It could be a trick of the light. Could be… but maybe not. Anyone who places the bookmark in a book for 24 hours, then holds the bookmark for another 24 hours gains a d4 Knowledge die in skill related to the book. Vipera: A double-edged “wavy” longsword with a leather-wrapped hilt and a snake-head pummel. The blade — which drips a magical poison when wielded — was recovered by a European knight during the Second Crusade in 1145 A.D.
Magellan’s Astrolabe: A magic item that grants the owner a bonus navigation checks. It was the result of a “you found a magic item” draw from the Savage Worlds Adventure Deck. The players have already had a poppy-inspired dream of the future that seems them traveling to a forgotten island populated with devolved cultists and monstrous dinosaurs who are protecting ancient temples of the Mu. With the central mystery revealed, our heroes will spend the next arc trying to prevent the Enlightenment from acquiring the arcane tools they need to find this lost island. As the game master, my challenge with Weird Pulp has been to keep things balanced. There needs to be just enough magic in the world to make it feel slightly wondrous, but at the same time that magic needs to be a subtle thing, more like the knowledge-granting boon of the Serpentine Bookmark than the traditional +1 sword you’d find in Dungeons & Dragons. Even when an item does grant a straightforward bonus, I try to connect it back to history. Thus, the magic compass isn’t just a compass — it’s an obscure (to modern minds) piece of navigational equipment once used by Magellan himself! Continuing to maintain this balance has been one of the most challenging — and fun — aspects of the Weird Pulp campaign, and it’s the one that keeps drawing me back to the game.